On May 8, the festibity, the party of information and communication technologies, took place at the Disseny Hub Barcelona. Act promoted by the School of Computing of Barcelona of the UPC and FIB Alumni, the Alumni Association of the Faculty of Computing of Barcelona. The City Council of Barcelona, the Government of Catalonia and the Polytechnic University of Catalonia also collaborate. In this edition, ICTs were positioned as protagonists of the internationalization process, as an engine of transformation, innovation and growth. As an indispensable factor for the reactivation of the economy. For this reason, companies that consider their internationalization objectives, betting on ICT in their strategy were present. In this event, FIB Alumni and FIB awards Festibity Mentions, which are a recognition of the work of people or companies that have distinguished themselves in the field of information technologies, defending values or ways of doing in line with the objectives of FIB Alumni and the FIB. 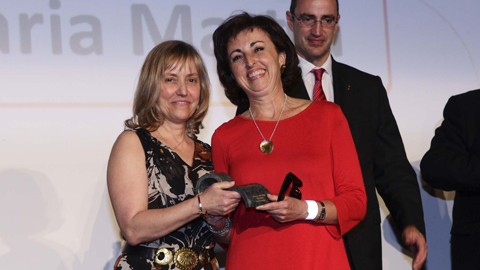 In this edition, the FIB Mention was awarded to our colleague and technical director of inLab Rosa Maria Martín for her perseverance, dynamism and contribution to the FIB brand. It is an award that expresses the recognition of one or more people who have developed outstanding work in the life of the FIB. To Juan Soto the Honorary mention: recognition to a person, company or entity that has distinguished itself in its trajectory by a contribution to the TIC in a significant way. To the GRIFOLS company the mention of the ICT Initiative: recognition of the project of a company that has recently distinguished itself in the field of ICT. To Álex Pajuelo and Javier Verdú from the company LudiumLab the mention FiberEmprenedors: recognition of a company driven by a Fiber, which has developed a relevant business project. Finally, the prizes of the 2nd Edition of the FIB Apps Award were also given. The Fibapps.net contest aims to promote the interest of university students on the importance of the Apps sector and entrepreneurship. It wants to promote "the development and knowledge of software engineering in the field of mobility". In this second edition the state / international competition has been aimed at active university students and the theme of the Apps was to develop applications that facilitate university life and collaboration between students. We want to publicly congratulate inLab Jonatan Fernández, member of the third classified team of the contest with the Clapp application of the Saturday Night Fiber team, as inLab David Martinez and ex-inLab Albert Almà, members of the team that was fourth classified with the StudyToDo application. Congratulations to the three!